WordOutliner is basically an outliner software, a document organizer, even a file manager as a Word add-in. 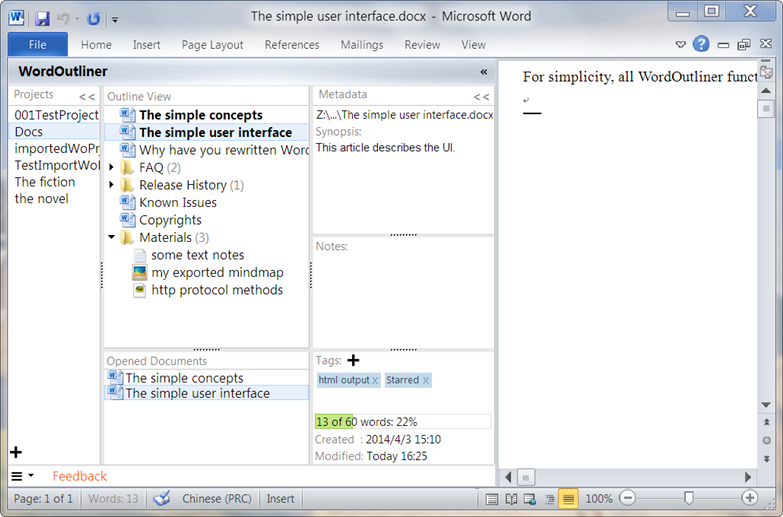 What makes WordOutliner different is that it’s tightly integrated into the Word window. WordOutliner is good for people who writes or manages a bunch of documents, for example, all kinds of writers, lawyers who has a lot of legal documents. WordOutliner is a complete rewrite of Writing Outliner aiming at 64bit Office support, better performance, better stabilities , file-system-as-storage (instead of Sqlite database files), and some other good reasons. To see how it works and why it’s better, head to the WordOutliner homepage for an interactive demonstration. If you are a user of the old Writing Outliner, the new WordOutliner will coexist with it. The FAQ page should cover many of the questions you may have, if it does not, contact the developer.